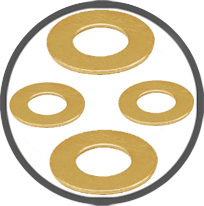 We are leading manufacturers and suppliers of DIN 125 Brass Washers, Brass Flat Washers, Brass Plain Washers, Brass Chamfered type B washers, ( machined Washers) and pressed type A washers from our factory in Jamnagar India. 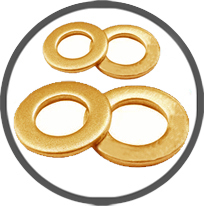 These Brass Washers, Flat washers to DIN 125 are produced on power presses of high accuracy within prescribed ISO tolerances. 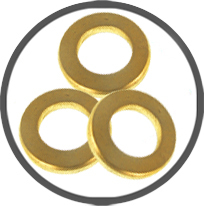 Brass DIN 125 type B washers are machined on automatic lathes and screw machines. Our range of Brass punched washers, Brass plain washers, Brass Metric Washers, Brass flat washers, Brass pressed washers ,Brass machined washers to Din 125 and DIN 126. These DIN 125 Brass washers are an integral part of all fastener assemblies and go very well with DIN 933 Hex head Brass Bolts Hex Brass cap Screws Set screws and DIN 934 Brass hexagonal nuts hex full nuts.